well as the addition of 2 new cup sizes. The original Juju was a shiny finish, and although it did have a butterfly grip pattern at the base, the shiny surface could make removal a little bit more tricky. The butterfly print is now a matte finish (with the remainder of the cup still shiny), providing extra grip when it comes time to remove the cup. The Stem now also features nodules. These nodules are designed to help strengthen and reinforce the stem, while also providing guidance on where to trim the stem, should you need to do so. In addition to the design changes, Juju has also released 2 new models. While the majority of women will be fine to use the original Model 1 or 2 Juju cups. The model 3 and 4 have been specifically designed to meet a current gap in the Australian market for women who have a particularly high or low cervix position. The Model 3 is much longer than the standard Juju cup and even longer than the Diva. 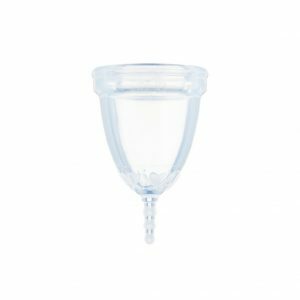 It is particularly suited to those women who have a very high cervix and who may struggle with the removal of standard size menstrual cups. While both the Model 3 and Model 4 designs are suitable for women who have given birth and who haven’t, they are NOT recommended for young women or virgins. These design changes and cup additions, along with fresh new packaging make the Juju cup a great choice for women wanting to begin the menstrual cup journey and who wish to support Australian made and owned!